I finished a cake for a coworker's dad a little while ago and am now sitting down to relax a bit. I'm waiting until the morning to take pictures so I'll share it tomorrow. Here is mine - it isn't much, nor big. For someone's baby shower. Chocolate, with Oreo buttercream. 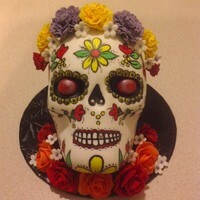 @LelekBolek that is a cute cake. I finally got my pictures downloaded from my camera so I can share my cake. The rainbow trout is modeling chocolate colored with luster dust and Poppy Paint for the black spots. The grass is wafer paper and the sand is Graham cracker crumbs. The fly is an actual fishing fly and the fishing line is floral wire. My coworker was very pleased with it especially since it was a last minute request. @LelekBolek such a cute cake. Love the little ducky. I have a question about the beads. What did you use to get the little beads on? @kstevens the rainbow trout is amazing. Kelly, that is so awesome, and does not look like last minute at all! Kelly- if that’s last minute I’d like to see what you can pull off when you’re not in a rush! 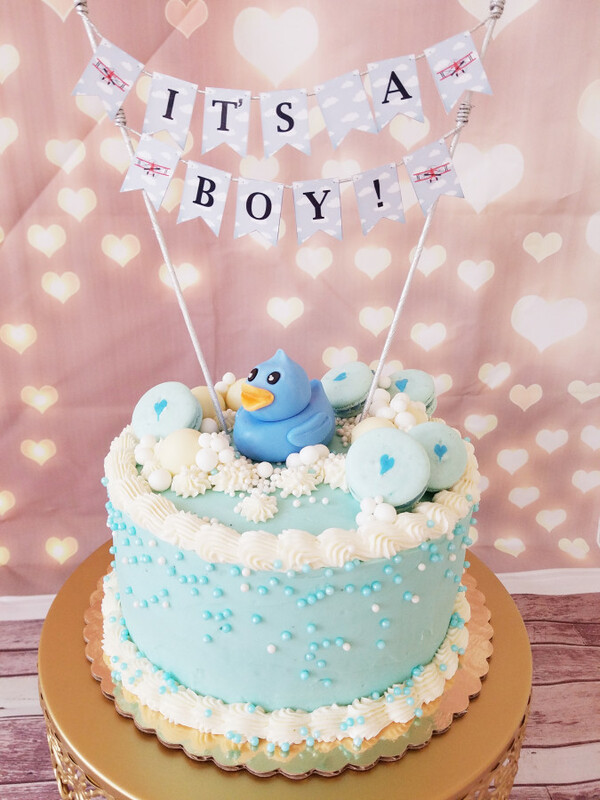 love that baby shower cake! My order this week was a 5 year old’s birthday. Her only request was rainbows and glitter :). Nothing for me this week, but I've started making of flowers for an upcoming project in April. First time making flowers other than roses. I'm having so much fun, and the precess is so therapeutic and relaxing! @LelekBolek your cake is too adorable! @Kstevens you did an awesome job with this trout! 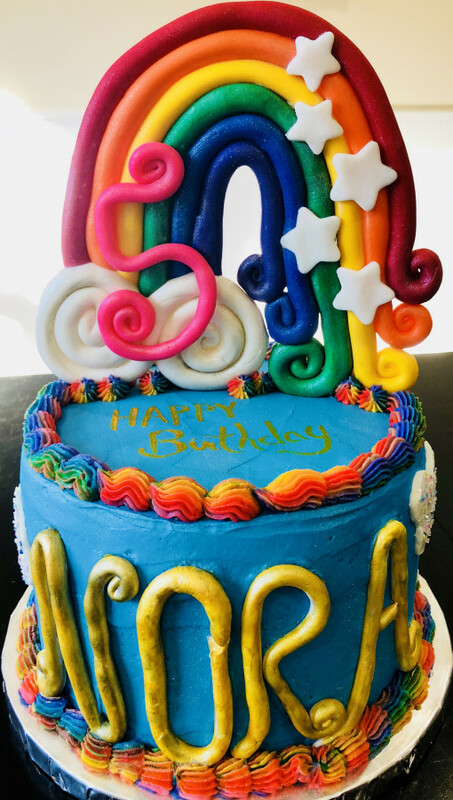 @MerMadeBakedGoods What a colorful and bright cake! I bet little Nora was thrilled. @MerMadeBakedGoods love the rainbow and the trim. @LelekBolek wow can’t believe they are thrown on. I may be doing a cake with pearls and unfortunately they are more in a pattern. May have to talk her into random placement. Laetia, looking forward to seeing your flowers - I agree, the whole process is so soothing. Making the same movements over and over again, just something very calming about it for me. 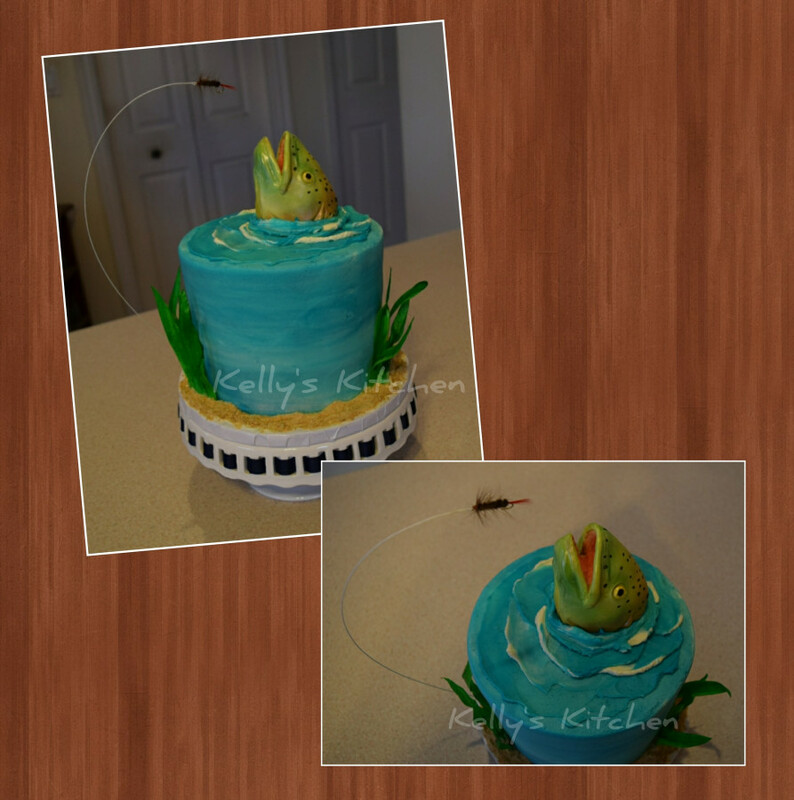 @LelekBolek - Such a cute cake and what a yummy flavor! 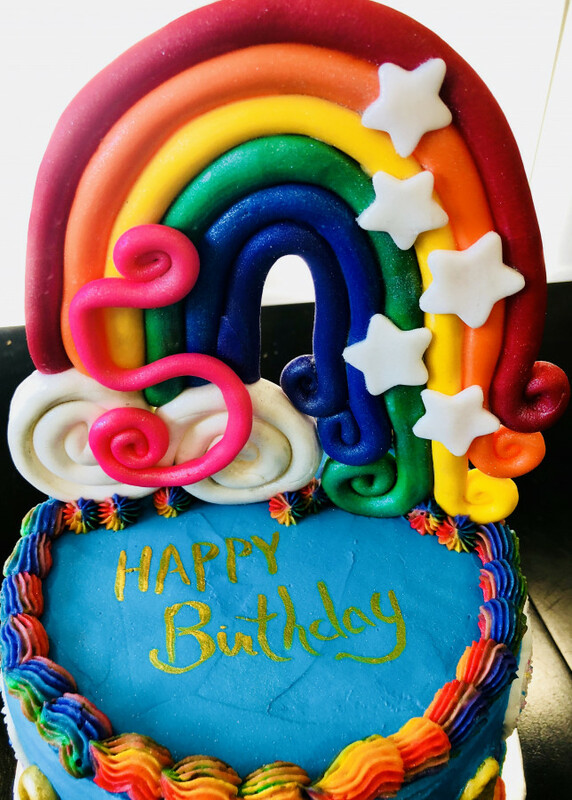 @MerMadeBakedGoods - Love the rainbow. Such a happy cake! 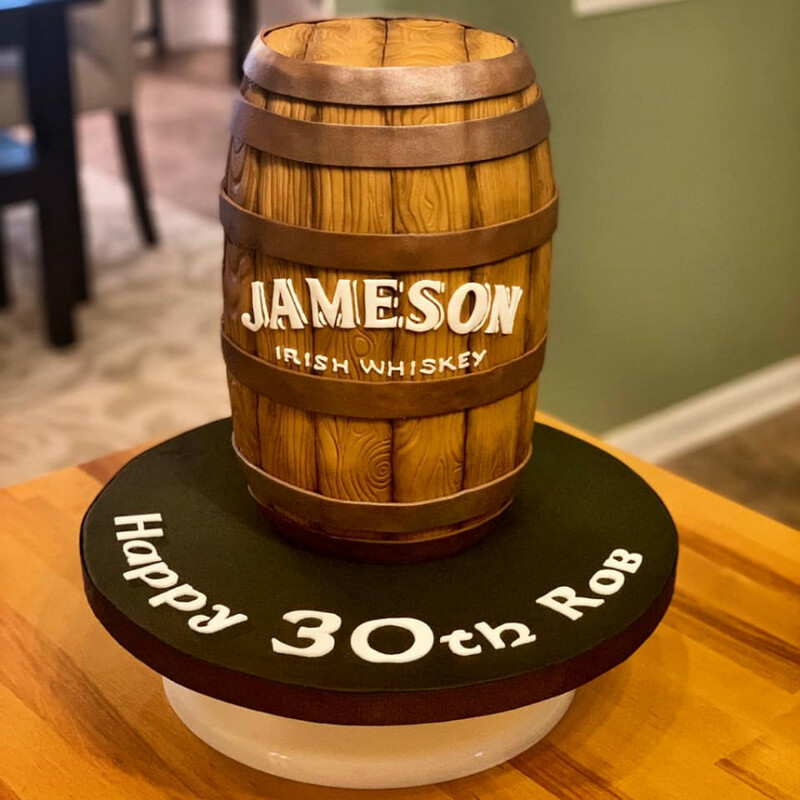 My order this week was for a Jameson Whiskey barrel cake. Very appropriate for a surprise 30th birthday party on St. Patrick's Day. It was red velvet WASC with cream chese buttercream filling. Please remember that I am an amateur and a complete noob, especially compared to all you amazing Friday Night Cakers. This is the almost-finished product for my daughter's 19th birthday. I still need to do some final clean-up on those edges. Thank you all for the compliments on my cake. I should clarify that since I work full time and play soccer one (sometimes two) nights a week that last minute for me is anything less than a week's notice. Thankfully after one failed attempt early in the week, the trout came together quickly the night before the cake was due. As a back up I started to draw one on fondant to stick to the side of the cake if the head didn't turn out. @MerMadeBakedGoods what a bright and fun cake! @Laetia good luck with your flowers and please do share pictures once they are done. What medium are you making them out of? I have recently started to use wafer paper more and more for my flowers and this week am trying to figure out daffodils. @Freckles0829 your whiskey barrel is awesome! @Rachel_n_VA great job piping those flowers! 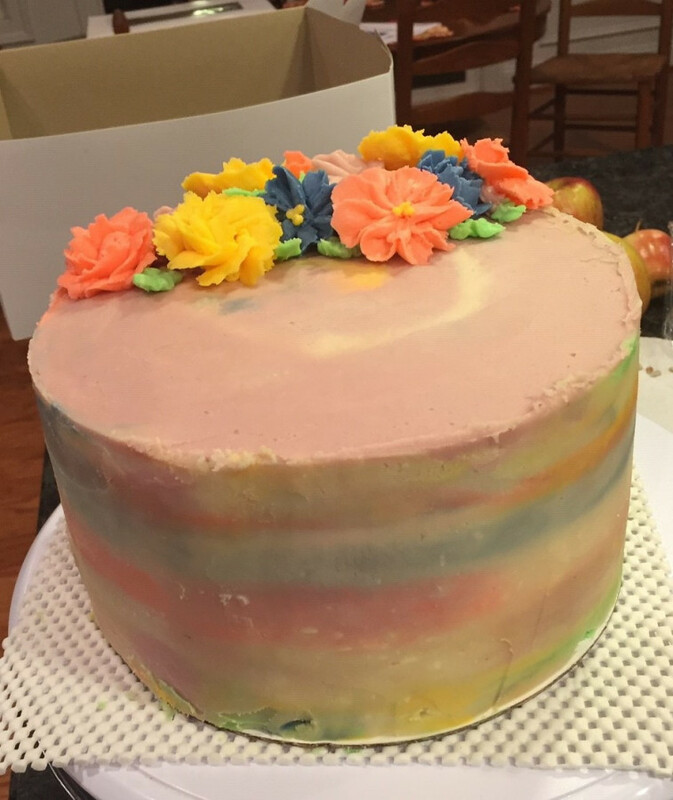 Rachel_n_VA you did a great job with your piping and I realy like the different colors on the side. Keep in mind that we've all started somewhere and we all still learn and get better at caking everyday. That's the beauty of it! Continue your good job and happy caking to you. Ok, here's where I am with my flowers. Mostly fantasy flowers and fillers. That way, if I miss and it does'nt look to what it was suppose to, no one will know but me, Ha! I still have many more to do, but I love what I've made so far, even though I find the ivory/gold berries/buds bouquet a bit busy and bulky. @Kstevens as you can see, I work with fondant and gumpaste. Unfortunately I'm no help with your daffodil wafer paper flowers. Though I have not made daffs out of wafer paper I think it would be rather easy. Just make a 7 (?) petal flat base 'petal' then a cone for the trumpet. On the base petals I think a slight crease down the center of each would add a bit of realism. It's been so long since I've made them in any medium I'm not sure. Where are the daffodil wafer flowers? I am missing something, I think. Daffodils have 6 petals, I believe. I made fondant daffs - fairly easy to make. For large ones - the cone part - I use the egg container to dry, and also a quail eggs container to dry the smaller cones. I will try to attach a photo, but please mind that these were last-second (not last minute), and for our private use? so I didn't spent "adequate" time and fuss on them. Ah, sorry, no photo option here either.